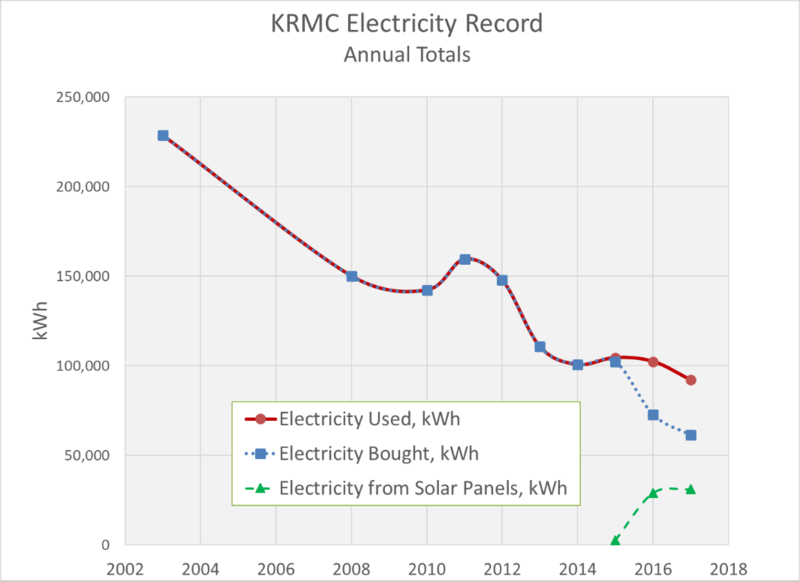 Over the past year Kern Road Mennonite saved significant amounts of electricity. See the figures below. 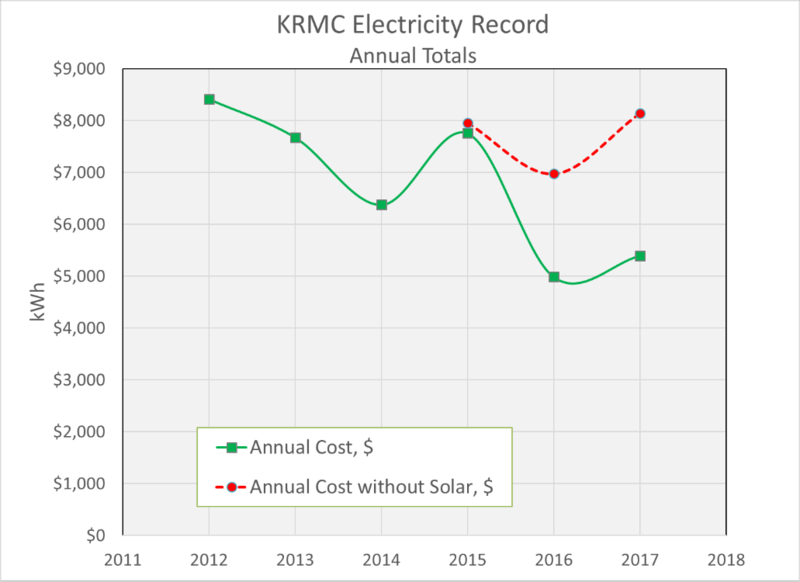 Compared to 2016 we used 10% fewer kilowatt-hours, kWh, and purchased 15% fewer kWh. Our solar panels account for the difference. Some of these savings resulted from a milder summer requiring less AC, but also, we are beginning to see noticeable reductions following the conversion of our exterior lights to LED’s in September. In addition, our solar panels produced 7.4% more output in 2017 compared to 2016. The cumulative effects of our efforts over the past decade and longer really add up. Since 2011 electricity purchased has dropped from 159,500 kWh to 61,280 kWh, a 62% decrease! Unfortunately, our cost savings since 2012, although very good, are less impressive at 36%. We have our electric utility, Indiana Michigan Power, to blame for that. In fact, last year electricity costs went up despite our purchasing 15% less electricity. On the bright side, without our solar panels our electricity costs are estimated to have been $2,742 higher, 51%, in 2017 alone, assuming the same price rate for the additional purchases. We are grateful for the cost savings, but also take satisfaction knowing that we are having a significant impact on atmospheric carbon, which in turn helps to safeguard our climate. Our solar-clad roof also presents a visible symbol to the local community of our commitment. This fall Solarize Northern Indiana (in which Margie Pfeil and I participated) assisted 74 households, a church, and a local business in going solar, with 21 more installations scheduled for 2018. 24 of these solar projects are in the South Bend area. Without the prior work done and example set by Kern Road Mennonite, this effort undoubtedly would not have moved forward as quickly as it did.